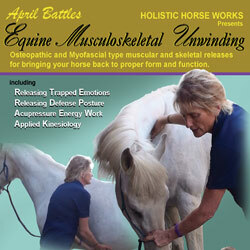 Now every horseperson can give their horse a treatment to boost the overall health and wellness of your horse. Apply to your fingers, let horse smell from each nostril. 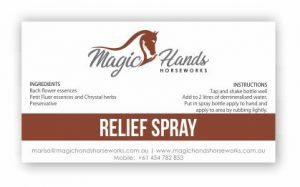 Then apply slowly and lightly to the sensitive inside of their ears and apply 360º around the whole coronet band of all four hooves. It helps to balance all the energy meridians in about 21 minutes. We have recently combined Essential Oils with Trace Minerals to formulate an amazing blend to use on your horse. 1) Apply to the frog and sole of the hoof and apply to hands and rub into the outside of the hoof wall and especially the coronet band. It starts to help balance the acupressure meridians as well. This is also replacing the hoof soak recipe! The horses love it! 2) Can apply to any other meridian points you feel are blocked on you or the horse. 3) Can clean your hands with it as the oils act as anti-fungal, anti-viral and anti-bacterial as well. 4) A friend fell off his bike scraped and banged his elbow-heat, swelling and we sprayed it on. All the heat and swelling gone next day! Simply add the concentrate to 1/2 gallon (or 2 Liters) of water and use in normal spray bottles. Mix with two litres of filtered water apply liberally to open wounds, and your horses hoof wall, soles and frogs. An all-natural, topical product that combines Bach flower essences and other natural ingredients to ‘release’ areas of the body experiencing inflammation, swelling, pain, etc. In my classes we put the concentrate into 2 to 3 liters of distilled water and lightly shake to activate. We apply it all over the head to help with Cranio Sacral work as well as to open the energy meridians we put along the back to tail and chest to belly button and around stifles and hocks especially inside where the muscles are the most tight. Great on my bruises as well when had foot stepped on! Price includes taxes and shipping. Tap and shake bottle well. Add to 2 litres of demineralised water. Put in spray bottle apply to hand and apply to area by rubbing lightly. If your horse has ever banged its head, fallen, or pulled back when tied at some time in their life it could cause the Cranial bones to shift (Google Equine Cranial Sacral). When a horse “pulls back” while tied to a solid fixture, the halter applies a thousands of pounds of pressure to the top of the head while the horse is struggling to free itself. Years later the horse might come up with mysterious issues that can be found on the Equine Cranial pages. Head tossing, spooking, allergies, auto immune and more are signals of this impact. You may want to Google what Cranial Sacral does for humans as well. 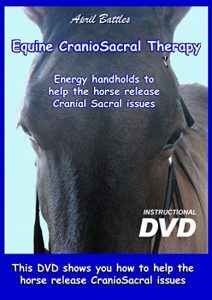 This DVD (formerly “Horses With Headaches”) helps you learn energy hand holds for Cranial Sacral releases that has proven to help my two horses, as well as hundreds of others all over this planet. The majority of training and behavioral issues are caused by pain issues in the horses body that are easily corrected. This results in a horse that is unwilling to switch leads, girthy or is a cold backed horse, unable to engage its hind end. These issues lead to high/low syndrome in hooves, roach back and hunter bump calcifications as well as arthritic hocks and side-bone. You can fix this! 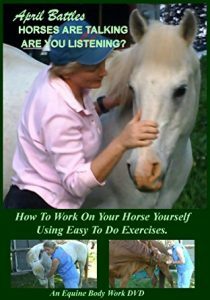 April shows you how to work on your horse yourself using easy Osteopathic, Myofascial muscular/skeletal releases and Acupressure releases. 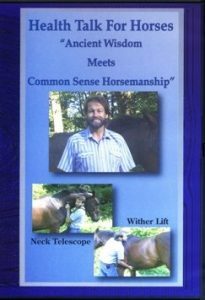 Ancient wisdom meets common sense horsemanship. A DVD by Dr. Regan Golob. This video is a must see to learn the basics, energy quadrants, nutritional reflexology points and body mechanics explained in detail. Learn the basics, energy quadrants, nutritional reflexology points and body mechanics of your horse. 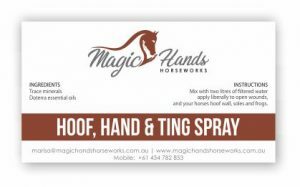 @ 2017 Magic Hands Horseworks.